Asphalt concrete pavements consist of a combination of layers, which include an asphalt concrete surface constructed over a granular or asphalt concrete base and a subbase. The entire pavement structure, which is constructed over the subgrade, is designed to support the traffic load and distribute the load over the roadbed. Pavements can be constructed using hot mix or cold mix asphalt. Surface treatments are sometimes used during pavement construction. Surface treatment acts as a waterproof cover for the existing pavement surface and also provides resistance to abrasion by traffic. Hot mix asphalt is a mixture of fine and coarse aggregate with asphalt cement binder that is mixed, placed, and compacted in a heated condition. The components are heated and mixed at a central plant and placed on the road using an asphalt spreader. Cold mix asphalt is a mixture of emulsified asphalt and aggregate, produced, placed, and compacted at ambient air temperature. The use of cold mix asphalt is usually limited to relatively low-volume rural roads. For higher traffic applications, cold mix asphalt pavement usually requires an overlay of hot mix asphalt or surface treatment to resist traffic action. The components of cold mix asphalt can be mixed at a central plant or in-situ with a traveling mixer. Surface treatments consist of an application (or sometimes multiple applications) of emulsified or liquid asphalt and select aggregate, placed over a prepared granular base or existing surface. Following placement of the aggregate, the mixture is rolled and compacted to provide a drivable, dust-free surface. This type of pavement is common on light- to medium- volume roads that may or may not already have an existing bituminous surface. The components of asphalt concrete include asphalt aggregate and asphalt binder. Mineral filler is sometimes added to hot mix asphalt concrete. Aggregates used in asphalt mixtures (hot mix asphalt, cold mix asphalt, surface treatments) comprise approximately 95 percent of the mix by mass. 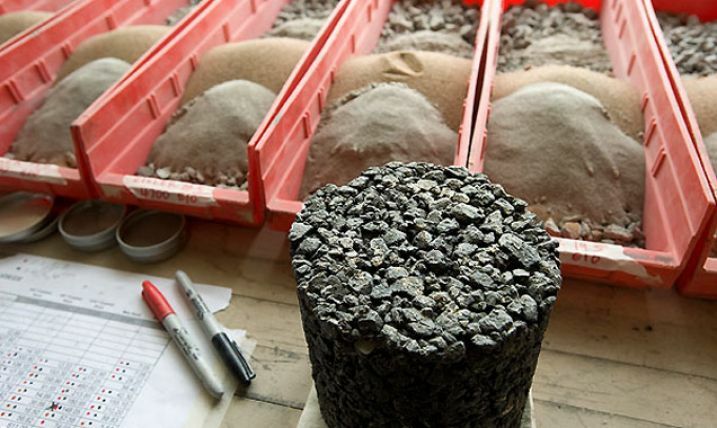 Proper aggregate grading, strength, toughness, and shape are needed for mixture stability. 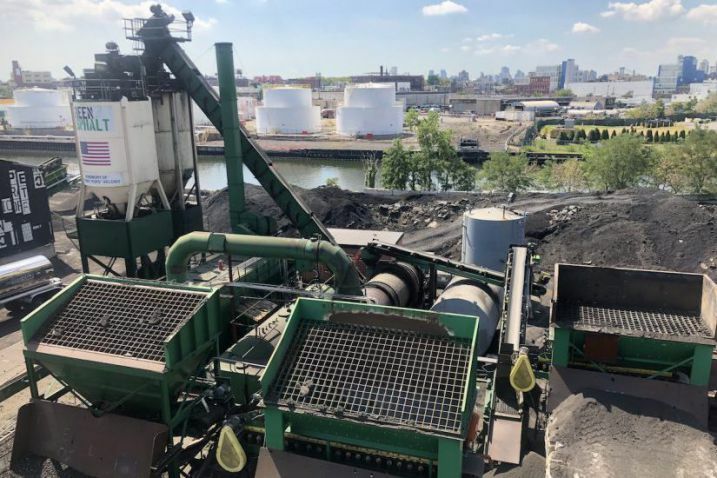 The asphalt binder component of an asphalt pavement typically makes up about 5 to 6 percent of the total asphalt mixture, and coats and binds the aggregate particles together. Asphalt cement is used in hot mix asphalt. Liquid asphalt, which is asphalt cement dispersed in water with the aid of an emulsifying agent or solvent, is used as the binder in surface treatments and cold mix asphalt pavements. The properties of binders are often improved or enhanced by using additives or modifiers to improve adhesion (stripping resistance), flow, oxidation characteristics, and elasticity. Modifiers include oil, filler, powders, fibres, wax, solvents, emulsifiers, wetting agents, as well as other proprietary additives. Mineral filler consists of very fine, inert mineral matter that is added to the hot mix asphalt to improve the density and strength of the mixture. Mineral fillers make up less than 6 percent of the hot mix asphalt concrete by mass, and generally less than about 3 percent. A typical mineral filler completely passes a 0.060 mm (No. 30) sieve, with at least 65 percent of the particles passing the 0.075 mm (No. 200) sieve. Gradation - the size distribution of the aggregate particles should be a combination of sizes that results in the optimum balance of voids (density) and pavement strength. Particle Shape - aggregate particles should be angular and nearly equidimensional or cubical in shape to minimize surface area. Flat or elongated particles should be avoided. Particle Texture - particles should have a rough, rather than smooth, texture to minimize the stripping of asphalt cement. Particle Strength - particles should be of sufficient strength to resist degradation or breakdown under compaction or traffic. Durability - particles must be durable enough to remain intact under variable climatic conditions and/or chemical exposure. Specific Gravity - the specific gravity of an aggregate is needed in order to properly design and proportion an asphalt mix. Absorption - the absorption of an aggregate refers to the amount of void spaces within a particle that may be filled with asphalt binder (or air or water), and is a measure of the tendency of an aggregate to absorb asphalt. The higher the absorption, the more asphalt cement will be needed. Volume Stability - certain aggregates may undergo volumetric expansion following prolonged exposure to moisture, deicing salts, etc., which may contribute to popouts, ravelling, and random cracking in asphalt pavements. Deleterious Components - some aggregates may contain harmful amounts of potentially reactive components (shale, chert, sulfates, alkalis, expansive silicates, etc. ), which may contribute to popouts, ravelling, and cracking in pavements. Penetration - a measure of the relative softness or hardness of an asphalt cement (or emulsion) at a given temperature. Viscosity - a measure of the resistance of an asphalt cement to flow at a given temperature. Ductility - a measure of the ability of an asphalt cement to undergo elongation under tensile stress at a given temperature. Incompatibility - a measure of phase separation of the components of polymer-modified asphalt binders during storage and use. Such a separation is undesirable since it results in significant variation in the properties of the binder and the asphalt in which it is used. Table 1 provides a list of standard test methods that are used to assess the suitability of conventional mineral aggregates for use in asphalt paving applications. Table 1. Asphalt paving aggregate test procedures. Table 2 provides a list of standard test methods used to characterize asphalt binder properties. Mineral fillers consist of finely divided mineral matter such as rock dust, slag dust, hydrated lime, hydraulic cement, fly ash, loess, or other suitable mineral matter. Mineral fillers serve a dual purpose when added to asphalt mixes. The portion of the mineral filler that is finer than the thickness of the asphalt film and the asphalt cement binder form a mortar or mastic that contributes to improved stiffening of the mix. The particles larger than the thickness of the asphalt film behave as mineral aggregate and hence contribute to the contact points between individual aggregate particles. The gradation, shape, and texture of the mineral filler significantly influence the performance of hot mix asphalt. Gradation - mineral fillers should have 100 percent of the particles passing 0.60 mm (No. 30 sieve), 95 to 100 percent passing 0.30 mm (No. 40 sieve), and 70 percent passing 0.075 mm (No. 200 sieve). Plasticity - mineral fillers should be nonplastic so the particles do not bind together. Deleterious Materials - the percentage of deleterious materials such as clay and shale in the mineral filler must be minimized to prevent particle breakdown. Table 3 provides a listing of applicable test methods containing criteria that are used to characterize the suitability of conventional filler materials for use in asphalt paving applications. Table 3. Mineral filler test procedures. Stability - the load that a well-compacted paving mixture can accept before failure. Sufficient mix stability is required to satisfy the demands of traffic without distortion or displacement. Flow - the maximum diametric compressive strain measured at the instance of failure. The ratio of Marshall stability to flow approximates the mix’s load-deformation characteristics and therefore indicates the material’s resistance to permanent deformation in service. Air Voids - the percentage of void spaces within the aggregate-binder matrix that are not filled with binder. Sufficient voids should be provided to allow for a slight amount of additional compaction under traffic and a slight amount of asphalt expansion due to temperature increases, without flushing, bleeding, or loss of stability. Stripping Resistance - the ability of a paving mixture to resist the loss of tensile strength due to stripping of the asphalt cement from the aggregate. Low resistance to stripping could result in mix disintegration. Resilient Modulus - a measure of the stiffness of a well-compacted paving mixture under prescribed conditions of load application. A mix having a low resilient modulus would be susceptible to deformation, whereas a high resilient modulus indicates a brittle mixture. Compacted Density - the maximum unit weight or density of a properly designed paving mixture compacted under prescribed laboratory compaction procedures. Unit Weight - a measure of the density of a paving mixture compacted in the field in accordance with project specifications. Table 4 provides a list of standard laboratory tests that are presently used to evaluate the mix design or expected performance of paving mixes. Recent developments in asphalt pavement design research which was conducted under the Strategic Highway Research Program (SHRP), has resulted in the development of a new asphalt mix design procedure, referred to as Superpave (Superior Performing Asphalt Pavement Design Procedure). Where the traditional mix design approach (using Marshall mix or Hveem design methods) was based on empirical laboratory design procedures, the Superpave mix design approach represents an improved system for specifying asphalt binder and mineral aggregates, developing an asphalt mixture design, and analyzing and establishing pavement performance prediction. The system includes an asphalt binder specification (performance graded binders), a hot mix asphalt design and analysis system, and computer software that integrates the system components. The unique feature of the Superpave system is that it is a performance-based specification approach, with the tests and analyses having direct relationship to field performance. Table 4. Asphalt paving material test procedures. Superpave mix design and analysis is performed at one of three increasingly rigorous levels of performance. Superpave Level 1 is an improved materials selection and volumetric mix design procedure; Level 2 uses the same volumetric mix design procedure as Level 1 as a starting point, in conjunction with a battery of tests to predict the mix performance; and Level 3 involves a more comprehensive array of tests to achieve a more reliable level of performance prediction. At present, only the performance-graded asphalt binder specification and Superpave Level 1 approach has been finalized, with the performance prediction models used in the Level 2 and Level 3 procedures still being validated. Users are referred to the Asphalt Institute Superpave Series No. 1 and No. 2 publications listed in the reference section for detailed information on the Superpave mix design equipment and test methods and on the performance-graded asphalt binder requirements. AASHTO Guide for the Design of Pavement Structures. American Association of State Highway and Transportation Officials, Washington, DC, 1993. Basic Asphalt Emulsion Manual. Asphalt Institute, Manual Series No. 19, Lexington, Kentucky. Mix Design Methods for Asphalt Concrete and Other Hot-Mix Types. Manual Series No. 2 (MS-2), Sixth Edition, Asphalt Institute, Lexington, Kentucky, 1994. Morgan, P. and A. Mulder. The Shell Bitumen Industrial Handbook. Shell Bitumen, Riversdell House, Surrey, U.K., 1995. Performance Graded Asphalt Binder Specification and Testing. Superpave Series No. 1 (SP-1), Asphalt Institute, Lexington, Kentucky. Superpave Level 1 Mix Design. Superpave Series No. 2 (SP-2), Asphalt Institute, Lexington, Kentucky.